Hello! I had three days off this week because of the holiday, so I had a little more 'free' time to play in my craft room than I usually have and I took advantage of that by playing the CASology Challenge. Their cue word this week is 'Apple'. I had purchased a lot of Flourishes stamp sets over Christmas that I had yet to use, so I thought it was the perfect opportunity to get this new set inky. I picked one of the littlest images in the set, this cup of cider and sliced apples, because I thought a small image would fit the Clean and Simple Challenge better than the main large apple image. I don't know if the owners of this blog will consider this card Clean and Simple, but I certainly do. It does have three layers, but they are all in the same color which gives it a very clean look. 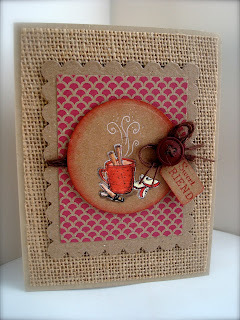 To make my card, I started with a Kraft base, then adhered DCWV Burlap Paper over the Kraft. Have you tried this new paper yet? It's fabulous! It is very thin, and it is burlap adhered over a thin paper. It's really ease to cut and it provides texture and interest without the bulk of real burlap. My second layer is Kraft paper again, this time cut with a Spellbinder Scalloped Rectangle Nestability. The next layer is designer paper from DCWV...it's another new stack filled with fun prints on Kraft paper. Finally, I cut a circle of Kraft paper and then stamped the image with white ink. I then stamped the image again on white card stock, colored it, cut it out, and adhered it over the white stamped image. The card was finished off with a cute sentiment tag, some brown twine, and a rustic button: Simple, Rustic, Country. Just beautiful! I hadn't seen the burlap yet. I can't wait to go see if our Joann's has it! Gorgeous! Your coloring is amazing! The burlap is fabulous, I love that it comes adhered to paper!!!! Thanks so much for joining us at CASology this week! Very pretty with a cozy feel...warm apple cider with cinnamon sticks. Love that burlap paper! The kraft/white/red colour combination is perfection! So glad you joined us at CASology this week! OH CLEVER! Great take on the challenge - never thought of apple cider, but now I have a craving! Great texture and rich colour on this warm card! Thanks so much for playing along with us at CASology this week! Must find some of that burlap paper! Very cute card, Amy! Thanks for sharing! Fabulous card and the burlap paper is a must have! Love your colour combinations and adorable image!